Tomato Achaar for sale. Buy online at Zingerman's Mail Order. Gourmet Gifts. Food Gifts. Achaar is the catch-all term for pickles made in India. Traditionally you'd serve achaar with rice, curry or dal and you can make some delicious dips and marinades with achaar by mixing it with yogurt. 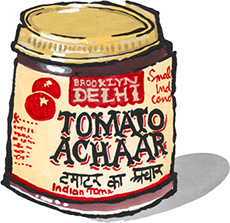 This particular achaar is made by Brooklyn Delhi in, you guessed it, Brooklyn New York. The folks at Brooklyn Delhi source the best ingredients they can find. The tomatoes they use come from farms in upstate New York. They start by chopping and brining the tomatoes then they mix them with tamarind, red chili powder, unrefined cane sugar, sesame oil and a blend of Indian spices like Fenugreek. The result is a relish you can use in all sorts of dishes. I really like to serve it with eggs in the morning. Slather a bit on your ham sandwich for lunch, and toss some with noodles or serve atop grilled meats for dinner. It's spicy, bright and sort of sweet/savory. Great with everything.